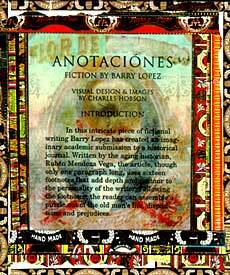 ANOTACIONES is a one-paragraph fiction with sixteen footnotes by Barry Lopez. 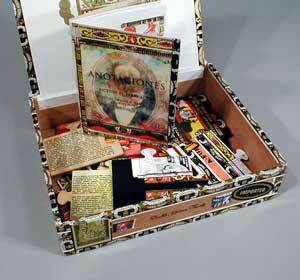 The footnotes have been printed on laser cut puzzle pieces, all contained in a cigar box with chemise. Assembling the puzzle organizes the footnotes in order to be read. Ink jet monotype, Color Xerox and offset litho. 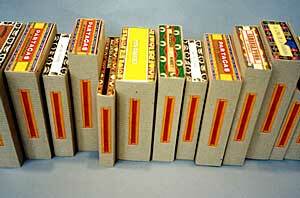 8 1/2 x 6 1/4 x 2.5 inches (size varies from box to box.) Seven pages and a fold-out version of assembled puzzle. Edition of 30. Out of print. ANOTACIONES is crafted by Barry Lopez as a story about Cuba, tobacco, history, cigars, heredity, genealogy, Castro and suicide  all in one paragraph, but with sixteen footnotes. The fictional Rubén Mendoza Vega, an aging Latin American scholar residing in South Florida, has written a submission to a historical journal. The seemingly straight forward main text is made far more intricate by the perfectly crafted fictional footnotes which reveal details and insights about the old man's life, disposition and prejudices. The paragraph that is the main text appears in an accordion book, measuring 5 3/4 x 4 1/4 inches accompanied by a bibliography of thirty-nine reference works  all imaginary. The book and the pieces of puzzles are housed in an actual cigar box which has been modified with collage and then enclosed in a corrugated board chemise. 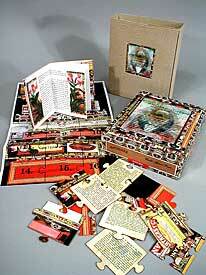 The puzzle when assembled shows an image of a stack of cigar boxes on one side and the text of the footnotes on the other. Assembling the puzzle orders the footnotes so they can be read in sequence with the main text. There is also a fold out sheet which shows the layout for quick reference. Work on Anotaciónes began more than four years ago when Barry Lopez suggested the story to me for a limited edition book because, as he said, it held "so many interesting design problems." Over the four years as an idea would occur to me I would work through its implications to see if it would prove out, often talking with Barry. Among the false starts was a series of still life paintings of objects that might have been on the old man's desk as momentous -- an inkwell, a pair of binoculars, a stack of books. The idea of a puzzle finally took hold because each of us, as readers, are being asked to assemble a picture of an old man through several irregularly shaped pieces of information. Pursuit of the idea was facilitated by a residency through Xerox PARC (the artists-in-residence program at its Palo Alto research center) where I was provided with access to a laser cutter with which to experiment in making puzzles. Because each book is housed in an actual cigar box, the size of each book varies depending on the box, but averages 9 x 7 x 2 inches.